Wall map mosaic of the Appalachians. This wall map measures 35 feet by 8 feet and consists of 51 plastic and 56 paper map sheets, complete or partial, to create a scene which extends from the Gulf of Mexico (left) to the Gulf of Saint Lawrence (right) at a scale of 1:250,000. North is on the oblique, to the upper right. Each of the 107 individual map sheets measures 1 degree of latitude by 2 degrees of longitude. Because longitude converges toward the poles, the sheets are trapezoids, rather than rectangles, and the more southerly sheets are wider than the more northerly sheets. This creates a challenge to form a mosaic in the oblique view shown. The map resides on the wall outside the Earth Science classroom, room 106 Collier Hall of Science. The 51 plastic map sheets portray the topography with a relief that has a vertical exaggeration of three times, so landscape features are readily apparent. 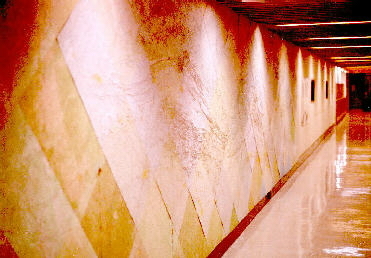 Many other wall displays were created by wallpapering maps and photographs to flat backing material which was then attached to the walls of the halls in the Department of Physics and Earth Sciences and within the Earth Science laboratory as well.